The Issuances tab enables you to manually create an issue. Evergreen will use the initial issue that you manually create to predict future issues. Click the Issuances tab in the Subscription Details. 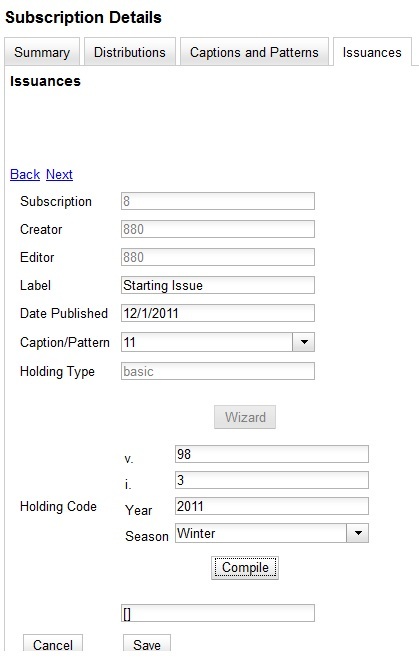 The Subscription, Creator, and Editor fields contain subscription and user IDs, respectively. These fields are disabled because Evergreen automatically fills in these fields. Enter a name for this issuance in the Label field. There are no limits on the number of characters that can be entered in this field. You may want to enter the month and year of the publication in hand. Enter the Date Published of the issuance that you are editing. Recommended practice is that you select the date from the drop down calendar although you can manually enter a date. If you are creating one manual issue before automatically predicting more issues, then this date should be the date of the most current issue before the prediction starts. Select a Caption/Pattern from the drop down menu. The numbers in the drop down menu correspond to the IDs of the caption/patterns that you created. The Holding Type appears by default and corresponds to the Type that you selected when you created the Caption/Pattern. In the holding code area of the New Issuance dialog, click Wizard. The Wizard enables you to add holdings information. Enter the volume of the item in hand in the v. field. Enter the number of the item in hand in the no. field. Enter the year of publication in the Year field. Enter the month of publication in the Month field if applicable. You must enter the calendar number of the month rather than the name of the month. For example, enter 12 if the item in hand was published in December. Enter the day of publication in the day field if applicable. Click Compile to generate the holdings code.